Daniel Doram, Tom Haines, Jonty Jenner and Delray Rawlins will be on the programme for a second year, whilst Joe Billings, Ellen Burt, Thomas Gordon, Tara Norris, Nicholas Oxley, Benjamin Twine, Nicholas Smith and Harrison Ward are all part of the Academy for the first time. Sussex Cricket has announced their Academy intake for the 2016 season. Four players have retained their places for a further year, whilst there are eight new players in the setup, an increase of five players from last year’s total. The Academy is a combined programme between the ECB and Sussex Cricket. All of the players have shown over the past year that they can put in high-level performances, as well as absorb new information and alter their techniques in the appropriate areas; achieving the set goals and earning their place on the programme. They have shown good evidence that they can portray the Sussex values which are of course a crucial part of Sussex Cricket and its Academy. The existing players in the setup are already making their mark on the professional game. Left-arm spinner Daniel Doram played much of the season in the Sussex 2nd XI and also made his second first-class appearance for the Netherlands, and batsman Tom Haines was named Sussex’s Academy Player of the Year despite only turning 17 last month. 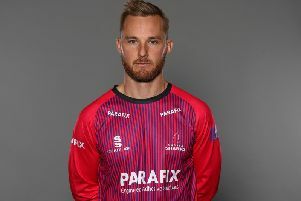 Batsman Jonty Jenner starred for Jersey in the ICC World T20 Qualifiers, averaging over 50, and Delray Rawlins, a left-arm spinner, also forced his way into Sussex’s Second Eleven after appearing for Bermuda in the ICC World Cricket League. Of the new players selected, Harrison Ward arrives as part of the link-up with Oxfordshire, having played for the Minor Counties’ side and hitting a century against Herefordshire earlier this year. Ellen Burt and Tara Norris are already established members of the Sussex Women’s team, which won the T20 Championship during the summer. Sussex’s Cricket Performance Manager and Academy Director Keith Greenfield said, “We’re hugely excited by the group we have together and are very much looking forward to the programme progressing. This year we have selected a larger but younger group, which gives us a slightly longer term view with them. “It is also nice to a see a number of these players having progressed from our Emerging Players Programme, which begins from age 13 upwards.